Matt Dibble's first visit to Chaco was during the editing of The Mystery of Chaco Canyon in 1998, when he was able to witness the full moon rising in alignment with the immense back wall of Chetro Ketl, a once-in-18.5 year event. Since then he has been hooked and is grateful that Anna Sofaer has asked him back many times. He has been a documentary filmmaker for twenty-five years with a wide range of projects on issues of human rights, diverse cultures, art and the environment. 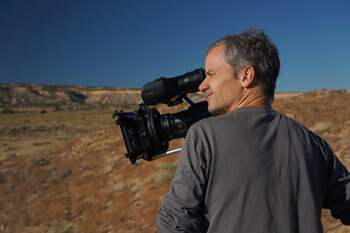 His work as editor and/or cinematographer has been seen in many PBS documentaries including: The New Metropolis, Rising Waters: Global Warming and the Fate of the South Pacific Islands, Forsaken Cries: The Story of Rwanda, and Expedition Alerce: Lost Forest of the Andes. Koryo Saram - The Unreliable People, about the mass deportation of Koreans to Kazakhstan in 1937, which he co-directed, shot and edited, won a 2007 Best Documentary Award from the National Film Board of Canada. He lives in Oakland, California with his wife Dana and son Jasper.